For $155, you get a 3D2N City View Room stay (worth $418). For $271, you get a 3D2N City View Room stay and 1-Day Hoa Lu Cam Coc Tour with Lunch (worth $560). For $513, you get a 4D3N City View Room stay and Halong Bay Overnight Cruise on V’Spirit Cruise with Kayaking (worth $782). 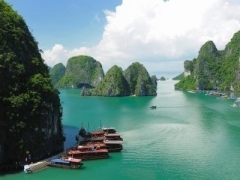 For $671, you get a 5D4N City View Room stay, 1-Day Hoa Lu Cam Coc Tour with Lunch and Halong Bay Overnight Cruise on V’Spirit Cruise with Kayaking (worth $1093). A look past the elegant furnishings and bedding in Serenade Hotel's City View Room can only complement the hotel’s eclectic views of old world charm in Hanoi's Old Quarter. Just out the door, old-time general stores, restaurants and specialty shops draw visitors year-round to experience the remnants of French colonialism in this little city. Opt for the cruise to experience a serene and peaceful side of Hanoi, as the ship drigts along Halong Bay. With its dark-wood furniture and pale off-white walls, the room simultaneously feels both rustic and stately. For a romantic evening, head up to Windy Panorama on the top floor for drinks with the dreamlike vista of Hoan Kiem Lake as a stunning backdrop. Experience this diverse city at your own leisure, or focus on the best parts with guided city tours, overnight cruises or day tours on Halong Bay. A one-day city tour of Hanoi begins with a visit to the Ho Chi Minh Mausoleum, a marble monument housing the embalmed corpse of the former president. Other cultural highlights include the Confucian Temple of Literature and the 11th-century One Pillar Pagoda, a wooden structure perched on stilts over a lake. A traditional Water Puppet Show culminates the tour before participants are free to explore the rest of the city on their own. Like a place out of an island dream, Halong Bay is scenic with incredible sights and unique geology. The UNESCO world heritage area is made up of two thousand islands rising from the waters of the Gulf of Tonkin, its landscape is a result of a complex chain during millions of years of geological movement. Choose the median stay of three or four nights and experience the sights and quietude of this beautiful place with an overnight cruise on the V’Spirit Cruise ship which includes delicious full board meals and an undeniably exciting adventure. Otherwise, settle for a condensed Halong Bay Tour which exposes guests to the best of this tranquil gem in Vietnam sans the overnight stay.